Home Costs > How Much Does a Double Wide Trailer Cost? How Much Does a Double Wide Trailer Cost? A double wide trailer is one of the most popular types of mobile home. Single wide trailers are 18 feet wide, on average, while a double wide trailer is at least 20 feet or longer. The cost of a double wide trailer is going to be a lot like pricing a home that is going to be built. It will depend on the manufacturer, the features included and condition. On average, a brand new double wide trailer can vary anywhere from as little as $40,000 to as much as $125,000. On the other hand, used double wide trailers can be significantly less. The costs, again, will be dependent on the factors mentioned above. Cumberland Homes, based in Alabama, offers the starting prices of some of their models on its official website. According to the pricing list, the costs can range anywhere from as little as $41,000 for a 28×52 to as much as $105,000 for a 32×64. Factory Direct Homes, a builder serving Oregon and Southwest Washington, has close to 50+ models and pricing listed on its website. Here, the prices start at $51,000 and can be as much as $95,000. The pricing, according to the website, will include basic delivery, setup and an interior finish 50 miles from the factory. The estimates above, depending on the factory you work with, may include the delivery, a basic setup and/or interior finish within a certain radius of the factory. This is often included only if you purchase brand new. Additional installed options, such as skirting, foundation, steps and/or decking, will be an additional cost. A double wide trailer will be made in a factory, built with a permanent chassis with wheels and tires. They can come in various colors, styles, and features or specifications, just like a single family home, ranging from the basics to something luxurious. If buying new, you should be able to choose the paint, exterior, flooring, cabinets and anything else that can be customized. The average double wide trailer can range anywhere from 12,00 to as much as 2,500 square feet, with the average double wide consisting of three to four bedrooms and up to two bathrooms. As with customizing a new home, the same can be said with a mobile. Popular upgrades can include upgrading the siding, doors, countertops, appliances, backsplash, lighting, lighting, water heater, cabinets, shower and/or adding/upgrading the fireplace. With hundreds of options available, the costs can be as little as $200 to upgrade to a stainless steel sink to as much as $2,000+ to install a full rock fireplace. If you purchase a double wide trailer from a previous owner, the process will be similar to that of buying a house. There may be extra fees such as a home inspection and closing costs. Most sellers will often exclude the shipping or delivery costs from the selling price, especially when purchasing used. Moving a mobile home can reach well into the thousands. 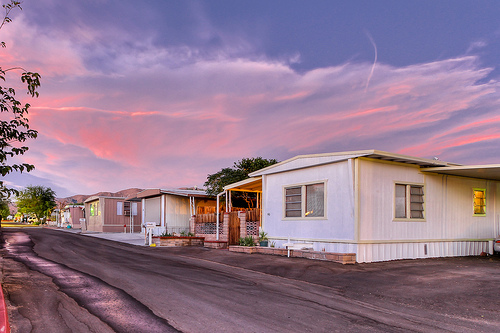 If you plan on placing your mobile home within a trailer park, the monthly lot fees will apply. These fees will largely vary depending on the geographical location and mobile home park. Like a house, insurance will be necessary. If any sort of plumbing and/or electrical has to be hooked up outside of the lot, additional fees may apply. Like a single family home, a used or even a repossessed double wide trailer can be much cheaper than buying new. Be sure to compare all options before committing.